Dr. Rosa was born and raised in Southeast Wisconsin. 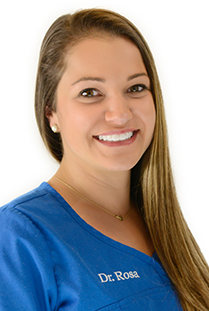 She enjoys taking the time to establish lasting and trusting relationships with each one of her patients. She takes great pride in helping to put an anxious child at ease and working to make their dental experience a positive and fun one! Dr. Rosa specializes in comprehensive dental prevention and treatment of children from birth to adulthood. Outside of dentistry, Rosa and her husband, Derek, enjoy spending time walking the beach, playing tennis, and boating.